And now, at long last, here you are. Your great idea is now an event bid approved by the branch. Now you can get with the seneschal and exchequer to arrange for paying for the site and other expenses. KEEP YOUR RECEIPTS. ALL OF THEM. Remind any event steward team members spending money (for instance, the head cook) of this as well. The branch has approved your budget, remember that key word budget. If you find that you will need more money than you thought, this will need to be approved separately at another business meeting. DO NOT just spend it and assume you’ll be reimbursed, that way lays unpleasant surprises. If in doubt, talk to your assistant event steward, the seneschal or the exchequer. That’s what they are there for, after all. The Known Wide World of Sports event became a reality! 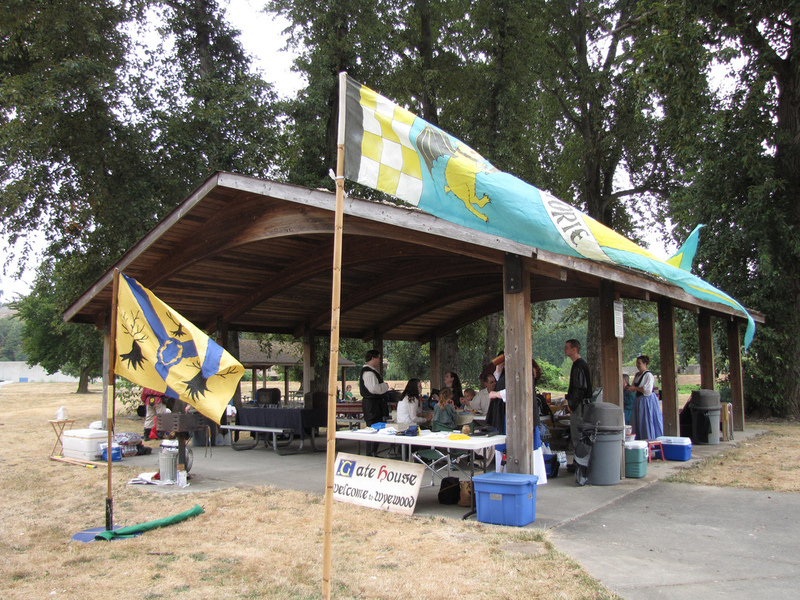 Here is the gate table and picnic shelter at the event. The gate is a very big part of your event. It is also one of the most important. This is were everyone will check into your event. You should create a volunteer roster and schedule a rotation for your gate people. Remember that no one wants to be at gate during the whole event. Have a talk with the exchequer about how Gate money is going to be handled. Who do you have to run your Gate? All persons running and/or responsible for Gate must be approved by the Exchequer. You and your Gate Keepers are jointly responsible for coming up with a way to ensure the control of cash at the event (see the ever-popular Financial Policy, Section VII). See to it that your Head Gate Keeper understands the procedure thoroughly and gets all the necessary forms from the Exchequer. You will be the one to deliver all the funds to the Exchequer along with the necessary reconciliation forms within seven days of the event. You will be issued a receipt for these funds. Do not assume that the Exchequer will run the gate. Put it in your notebook and don’t lose it; in the unlikely event of questions being asked, it could become very important. You will also need to request any petty cash for the Gate’s cash box from the Exchequer. Also, don’t forget to make arrangements with the Exchequer to get the cash box itself. This needs to be done a good two weeks in advance of the event, so plan accordingly. Have you talked with the seneschal to get the gate box? Don’t confuse the gate box with the Exchequer’s cash box. The gate box holds all the waivers that your participants must sign. You may even need a second person at the gate to be in charge of waivers. As each branch is required to have at least one official event listed on the Kingdom Calendar each year consider this as a must do step for any event! Go to Antir Upcoming Events and download a copy of the Date Reservation Form to give to the seneschal to fill out. Send it off to the Kingdom Calendar Deputy, keeping a copy in your trusty notebook. This will get your date reserved on the Kingdom Calendar, which is published in the Crier. Depending on the type and scope of your event, you may want copy to appear in the Crier as well. If so, download the Event Information Form at Antir Upcoming Events and fill it out according to instructions. This is also sent to the Kingdom Calendar Deputy, and must be received in order for copy to appear in the Crier. Event copy is what will make people want to come to your event. If you don’t feel like you’re much of a writer, ask your event steward team for help. Use the various Kingdom mailing lists as well as those for local groups to spread the word. If you need to send off for a Certificate of Insurance, this will need to be done at least 45 days prior to the event. You will need to make a copy of the request and check for your records. Start making lists of what equipment you will need to hold your event. The seneschal and exchequer have records of what Wyewood owns, and where these things are currently located. Think about transport needs both to and from the site. Again, make arrangements for collecting these things (feast supplies, SCA signs, etc.) well in advance (at least two weeks) of the event. Do not assume that this will be brought to the event with out you asking for it and making the appropriate arrangements. Remember that the site needs to be taken down, as well as set up. Organize your support personnel so that the same people are not doing it all both times. We leave places cleaner than we found them, and if that means you are the last person on site, picking up stray bits of trash, well, that’s your job. Do not forget to thank them at the end of the event. Talk things over regularly with your event steward team, in person or by e-mail. Make a note of anyone who is doing especially good work, they might need an award recommendation. 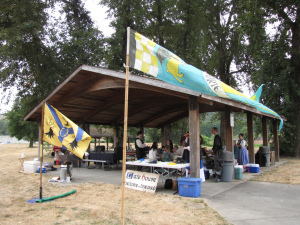 You may recall from your reading of the Wyewood Financial Policy that every event steward (in conjunction with the exchequer) is required to submit an event report within thirty days of the conclusion of the event (see Event Report Form). This is VERY important; failure to submit this form on time will result in disqualification from being the event steward of any future Wyewood events. As you finalize everything the Kingdom Event Report can be helpful to organize your final report. Soon Wyewood will have a template for final event reports. Lastly, once it is all over and all the paperwork is finished, remember to thank everyone who helped you. A small gift of some sort is nice, too. Knowing that their efforts are appreciated will bring people back to work with you again. It really was a great idea.